The Sunday rides stop at a number of local cafes and garden centres. Some of these are also used by the Coffee Pot riders on Thursday mornings. Generally all these locations welcome cyclists - but note that some are not open every day, so if you are not on a CTC-organised ride it could be worth phoning them to check that they are open. 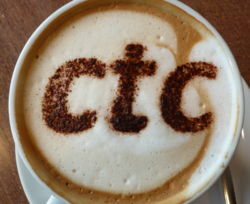 If you wish to find a cafe further afield - try using the CTC's Cyclists Welcome Web Page. The Devon list is also available as a Word document which can be printed out. Note that this list was last updated in 2009 so may not be fully up-to-date. Click on markers to determine name of cafe. The Old Coffee House is in West Street adjacent to St Andrew's Parish Church. Bampton Bakey also serves teas and coffees. The bakery can be found in Brook Street, Bampton. Confusingly there is another Bickleigh in Devon in the Plym Valley north of Plymouth. This one is alongside Bickleigh Bridge in the Exe Valley 15 km north of Exeter on the A396, and 7 km south of Tiverton. The Brookside Tea Rooms are in Station Road 500m west of the centre of Bovey Tracey. The House of Marbles is sited just off the A 382 in Pottery Road 1 km south of the centre of Bovey Tracey. The Devon Guild of Craftsmen operate in the Riverside Mill which is in the centre of Bovey Tracey. The Copper Kettle is in Station Road 500 m west of the centre of Bovey Tracey at the junction between the A 382 and the B 3344. The Bow Aquatic Centre is sited on the A 3072 500 m west of Bow. The Fort Cafe is situated in the Berry Head Country Park just east of Brixham. The Otter Nurseries are situated 1.3 kilometre west of Brixton on the A 379 Kingsbridge to Plymouth road. Somerfield's supermarket is 1.5 km south east of the village of Broadclyst on a minor road linking Broadclyst with the old A30 just north of Exeter Airport. The cafe is inside the supermarket on the first floor. The Grange Restaurant is sited within Buckfast Abbey. The Singing Kettle is in Fore Street, Buckfastleigh. The Longboat Cafe is on the sea front walkway east of the centre of Budleigh Salterton. The Oak Lodge is associated with Budleigh Salterton Riding School on the same site. It is convenient for road cyclists and mountain bikers using Woodbury Common. Canonteign Falls are in the Teign Valley 4 km north of Chudleigh on the B 3193. Blacks Deli is sited just down the hill from the Market Square. The Bullers Arms is in Mill Street, Chagford. The Courtyard Cafe is a vegetarian cafe sited on North Street just downhill from the Market Square. The Globe Inn is in High Street, Chagford. The New Forge Tea Room is in Chagford's Market Square. The Friar Tuck is in the Holiday Park at Challaborough. The Woodleigh Coach House and Cafe is sited 1 km east of Cheriton Bishop adjacent to the Woodleigh A 30 junction. Harvey's Delicatessen is sited in the centre of Chudleigh. Colyton Station is 500 m east of Colyton. Note: The Station Teas Rooms are normally closed on Sundays (unless by prior arrangement). This cafe is sited within the old railway station buildings. The station is 1 km south east of the centre of Crediton. The golf club is sited 1 km south of Cullompton. When leaving Cullompton southward on the B3181 you reach a small roundabout. The golf club is straight on. Cyclists normally meet in the Sports Bar. Bow Windows Cafe is in the main shopping street in Dawlish. Signal Buffet is in the Railway Station Building in Dawlish. The Cafe/Restaurant is sited 500 m north west of the village of Dunkeswell overlooking the runway of Dunkeswell's airfield. Bernaville Nurseries are 1 km north of Cowley Bridge on the A377 Exeter to Crediton Road. Lutzys is on the western side of Exeter Quay on Piazza Terracina. Note: There are two St Bridget Nurseries within 2 miles of each other - make sure that you go to the correct one! This St Bridget Nursery is 1 km east of the village of Clyst St Mary on the A3052 Exeter-Sidmouth Road. The entrance is opposite the Devon Showground. Note: There are two St Bridget Nurseries within 2 miles of each other - make sure that you go to the correct one! Old Rydon Lane is 1 km north east of the Countess Wear Roundabout in south east Exeter. Old Rydon Lane links the A379 (Rydon Lane) with Clyst Road. Harbour View Cafe is sited on Exmouth sea front east of the Pavilion and directly opposite the Inshore Lifeboat Station. King's Garden Centre is 3 km north of Exmouth on Marley Hayes Road (this is a continuation of Hullam Road northward). If approaching from Exeter or Topsham it is best to approach the Garden Centre from Woodbury along Exe View Road and then turn north (left) up Marley Hayes Road. The café is on the north side of the High Street just east of the centre of Honiton. Kilerton is a National Trust property 10 km north east of Exeter. Kilerton is just off the B3181 near Budlake. The cafe is in a layby off the busy A 380. The Waterfall Tearooms are 2 km south west of the village of Lydford. Shears Cafe can be found in the centre of Lympstone opposite the short road to the railway station. Southern Cross is at the western end of the High Street through Newton Poppleford. The Barkhouse is sited on the A396, 5 miles south of Dulverton, and 2 miles west of Bampton. Meldon Viaduct is 4 km south-west of Okehampton Station along the Granite Way cycleway. Okehampton Station is 1 km south of the centre of Okehampton. Otterton Mill is sited at the western end of the main street through the village. Escot is 3 km north west of Ottery St Mary on a minor road linking Talaton with Ottery. The main entrance to Escot is from this road but it is also possible to enter from the east along a farm road which joins the Ottery-Feniton Road about 1 km north of Pateson's Cross. Powderham Castle and grounds lie 12 km south of Exeter just east of the A379 Exeter-Dawlish Road. The Orangery Restaurant is part of the Country Store. The main entrance can be found off the A379 500 m south of Kenton. The Restaurant can also be accessed (or exited) on a permisive track which leaves the unclassified coastal road 1 km north of the centre of Starcross. The cafe is sited at the golf driving range on the link road between Tiverton Parkway Station and Sampford Peverell. Fingle Glen Golf Club is sited some 2 km east of Tedburn St Mary just off the old A30. It is 1 km west of Pathfinder Village. The Four and Twenty Blackbirds is in Gold Street. Gold Street runs eastward from Tiverton's shopping centre. The Mad Hatters is in Fore Street in the centre of Tiverton. Morrison's supermarket is sited on Kennedy Way 1 km north of the centre of Tiverton. Coldharbour Mill is sited 1 km south west of the centre of Uffculme. The Mill can be found by following the brown tourist signs to 'Working Wool Museum'. Waterloo Cross is 1 km east of M5 Junction 27 on the A38. The Beam Bridge hotel is on the A38 3 km west of Wellington. Blackdown Garden Centre is 4 km east of Wellington on the A38 to Taunton. The Europa Cafe is at 17 High Street, Wellington. Willowbrook Nurseries are 4 km east of Wellington on the A38 to Taunton. Willand Restaurant is sited behind the petrol station on the B3181 1 km south of the centre of Willand and 200 m north of the bridge over the M5. This page was last edited on 10 February 2019, at 12:39.